I'm having lots of fun at the moment with the new, limited-time products: Blended Seasons stamp set and coordinating Stitched Seasons Framelits dies. They're soooo versatile!! I've kept this card basic and suitable for any occasion. In upcoming posts I'll be sharing some Christmas cards that I made with these great products. As they are limited-time only, they'll be available only from 1 - 31 August or while stocks last. If you'd like to get them right now - join up and include them in your starter kit. 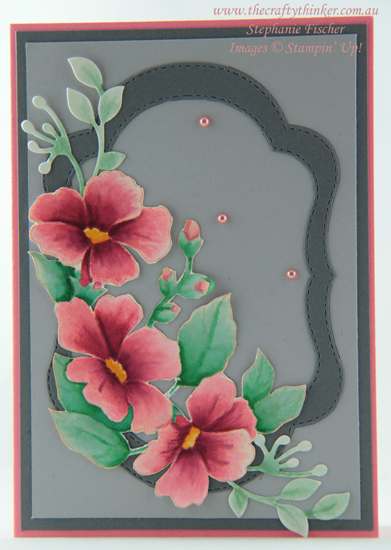 The base card is Flirty Flamingo followed by Basic Gray and Smoky Slate layers with a frame cut from Basic Gray cardstock with two of the framelits. I cut some of the leaf shapes from Shimmery White cardstock and gave them a quick watercolour with Mint Macaron ink. The main floral image was stamped onto Shimmery White cardstock with Petal Pink ink and then watercoloured with Petal Pink, Flirty Flamngo and Merry Merlot inks with centres of Crushed Curry and Mango Melody and foliage in Mint Macaron and Shaded Spruce. I fussy cut the floral image and adhered everything to the card front, finishing with a scattering of Share What you Love Artisan Pearls.